#6 This move only works against Bryan. this comes from Tekken Zaibatsu forum. I recommend to do bb+1+2 after special taunt. It looks like an execution for Bryan's dirty work! WHAT GAMES THIS ON? NOT LIKE IT'D MAKE A DIFFERENCE, I STILL DON'T UNDERSTAND A WORD YOUR SAYING! This game is Tekken 5. 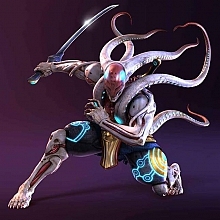 Those are two taunting moves for Yoshimitsu. The Bozo : WHAT GAMES THIS ON? NOT LIKE IT'D MAKE A DIFFERENCE, I STILL DON'T UNDERSTAND A WORD YOUR SAYING! 1. Don't post in all caps, it's considered disruptive. 2. Read some Tekken FAQs, get informed in legend, then come back to the moves topic, without shouting like this. Anyway, we have a legend on our site, huh? Go to home page (Legend link) or Yoshi's move list in YO Team section, and You'll see it. Hello . old topic should become alive for short time. To day I discovered a bug with those hidden moves. Yoshi fans aren't interested in?? That's a nice bug! post it in TZ forums. I'm mot going to give a post on TZ about it. This will be in my Tekken movie with juggles. I decided to put it here, be cause I thought this is the best place,this bug doesn't need a new topic,and this one regards those moves. There's plenty of tricks after f,f+1+2 in Tenshi's FAQ. There's a link to it on the front page. To help you out a bit, you can use b+3+4 immidiately after f,f+1+2 to do an evasive spin. This will damage you a bit but nothing can hit you and you might be able to punish an opponent's attack. Hope it helped. What this has to do with this topic? don't thread this topic as a garbage! thanks, 'Bigchief',, yeh sorry, but whats the point of this stupid hidden move? as if anyones gonna use it.... another thing how do i put a pic under my name(bullrage)?